Nowadays diseases like West Nile virus, Zika virus and Malaria are a threat in many parts of the world. And since not all mosquito-borne diseases have vaccines to prevent or even to treat these illnesses, all you can do to not get infected is to take precautions so the mosquitoes cannot bite you in the first place. So make sure to check out our best mosquito repellent list. One of the best products that also is one of the most used ones is the Repel Lemon Eucalyptus. This repellent is completely natural, so it doesn’t contain DEET or any of the other chemicals, and it will last for up to 6 whole hours, meaning that you will only need to reapply every 6 or so hours to prolong its efficiency. The active ingredient in this product that works is Oil of Lemon Eucalyptus which is the natural equivalent to DEET. And although not everyone is convinced that this oil really is as good as its chemical equivalent, it works wonderful at least in this Repel spray and it is approved by the CDC as the only natural insect repellent you should use. So spray it on your exposed skin, clothes and gear and keep away not only mosquitoes that can carry different mosquito borne diseases, but also other pests like deer ticks, that also can carry diseases and be harmful to your health if one manages to bite you. On top of being efficient, fairly long lasting and overall good against mosquito, this bug spray also has a refreshing scent, that will make using this spray much more enjoyable, it won’t leave any residue, like some other repellents tend to do and the 4 ounce bottle with a pump spray will let you not only easily use it and apply it even to the harder-to-reach areas of your body like your back, but it will also let you easily pack it whenever you go on vacation or on a trip and use it to keep yourself and your family safe from mosquitoes. Effects of it lasts up to 6 hours. The small bottle might run out quickly if it is used by a large group of people. This, too, is among the mosquito repelling products that work and that doesn’t use DEET, yet is very effective at protecting you from mosquitoes, ticks and other insects that can cause more than an itchy bite mark on your skin. If you know that you will be spending a lot of time outdoors, like going hiking, hunting or fishing, but you won’t have a lot of time to apply and reapply your bug spray, then look in to this mosquito control option. 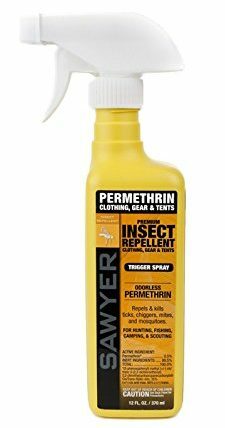 It is made with Permethrin, a non-toxic active ingredient that is very long lasting and efficient at repelling different bugs. Just make sure that you apply this best mosquito control product on you clothing, bags or other gear rather than your skin, because it is very potent. It won’t damage fabric, plastic or other materials or stain them. The efficiency of this Sawyer spray is rated up to 42 days of sun exposure or up to 6 washings. That is because it is made with Permethrin not DEET, and since Permethrin attaches to the surface it is sprayed on, bonding with the material fibers, it has the ability to stay there for extended periods of time and protect you from insects and bugs. Insect spray comes in 12-ounce bottle, that will enable you to spray at least 2 complete outfits, mosquito-proofing them and yourself. The trigger spray bottle in which this product comes in will make it easier and quicker to apply it, and after the repellent has dried (about 2 hours after it is applied), it leaves no residue or odor, meaning that nobody will be able to tell that you have mosquito protection on your clothing, but just will be able to see the effects of this spray. Use this Sawyer mosquito repellent to create your first line of defense against mosquitoes and other flying and biting pests. The trigger spray bottle is easy and ergonomic to use, so won’t cause you any problems upon application. You have to wait at least 2 hours after you spray your clothing, because that is approximately how long it takes to dry. Those who aren’t afraid of using products that have DEET in them and who want to be sure that mosquitoes won’t come near them, should try this other insect repellent by Repel called Repel 100. Because this bug spray consists of 98.1 percent of DEET formula, it will be sure to provide very long lasting protection against such insects as mosquitoes, ticks, chiggers, gnats and biting flies. You could easily call this “the best mosquito repellent”, because it will give you maximum protection without having to spend a ton on money on expensive solutions. The Repel 100 comes in a 4-ounce bottle that is equipped with a pump spray which will make it convenient to use it even on the go. Moreover, because it has a lasting power of 10 hours and the liquid will stay put on your skin even in extreme weather conditions, you won’t have to apply it very often, so you will be able to enjoy your time outdoors without the worry of mosquito bites or mosquito-borne diseases. Just throw a bottle of this insect repelling solution in your car, travel bag or hiking backpack and you are good to go and enjoy a mosquito- free time. You can spray it on your exposed skin, as well as your clothing and any other gear you might have with you outdoors. The 4-ounce bottle might be too small to use on big group of people or for extended periods of time. 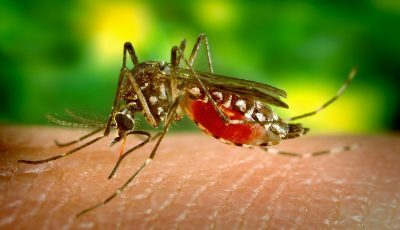 If you are going on a vacation to an exotic tropical place where you know that there are going to be a lot of mosquitoes, then you might want to consider buying a repellent that doubles as sunscreen, because in this case you want to not only avoid the bugs, but also protect your skin from the sun. And a good option, that has received praises from a lot of beauty and skin experts is this Avon Skin-So-Soft Bug Guard Plus. Because this product is primarily a moisturizing sunscreen lotion, it will be sure to keep your skin protected from those sun rays. 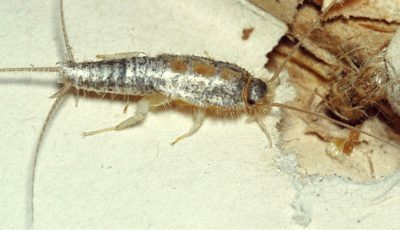 But, since it also contains an ingredient called Ethyl butylacetylaminopropionateI or IR3535 (Insect Repellent 3535) for short it also serves and quite powerful mosquito and other bug repellent. It will protect you from mosquitoes, deer ticks, gnats, black flies, biting midges and some other insects, that tend to ruin our time outdoors. In terms of efficiency this moisturizing lotion with SPF 30 will guard your skin from the sun and bugs, even in the water, because as long as you aren’t in the water longer than 80 minutes, you should be fully protected. However, I would advise to still reapply the lotion after you dry off, since that will provide better protection and the aloe and vitamin E combination that this lotion contains also will leave your skin soft and moisturized. Use this lotion on the beach, by the lake or simply while hiking or working out, and you should be free from bug bites and sunburns. Lotion comes in 4-ounce bottle meaning, that it will last you for quite some time. Not everyone likes that it is a sunscreen lotion and bug repellent in one, since you don’t always need SPF. Another lotion type insect repellent, that will provide long lasting protection against mosquitoes and other annoying insect and won’t irritate your skin is this Sawyer Premium product. 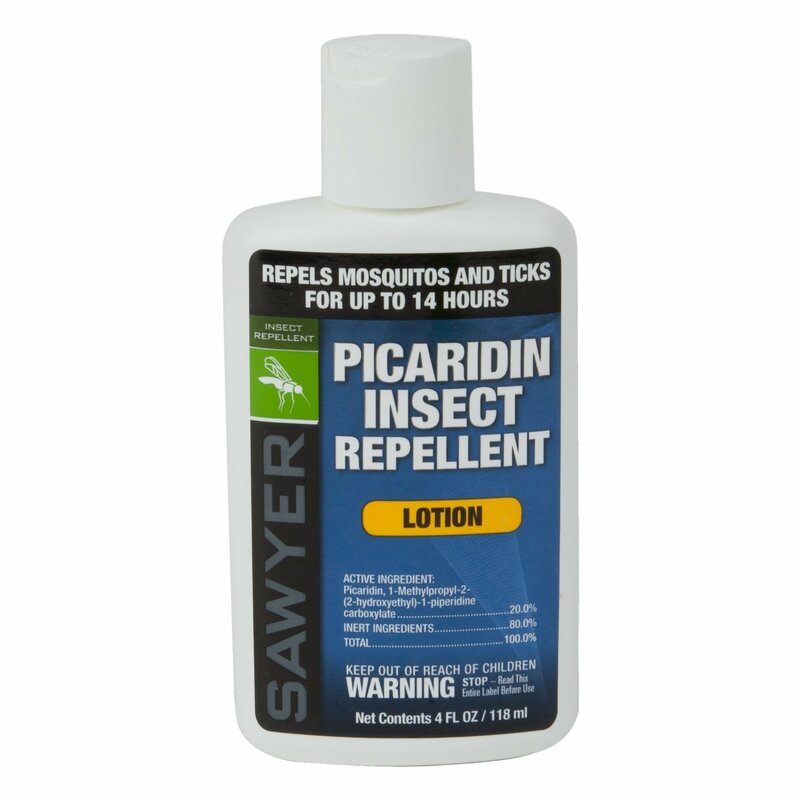 The active ingredient in Sawyer Products Premium repllent is Picaridin, which makes up 20% of the lotions consistency. Picaridin is a well-known substance that has showed amazing results at combating not only mosquitoes, but bugs like flies, gnats and chiggers, too. And it is used in this lotion mainly because it is able to provide up to 14 hours of protection from mosquitoes and ticks and up to 8 hours of freedom from other species of biting insects. So once you apply this lotion on your skin, it will efficiently scare of pests for half a day. Formula of this product also was rated recently and it now holds the place of the best, safest and most efficient insect repellent. So pick up one of the 4-ounce tubes of this lotion, apply it on your skin or even on your bags and clothing, since the lotion won’t harm your skin or any other fabric and won’t leave a residue once dried, and enjoy your time without mosquitoes and mosquito bites. This lotion has a pleasant odor, that will make the application process more enjoyable. It might be harder to apply the lotion on clothing or other objects then it would be if you used spray-type product. 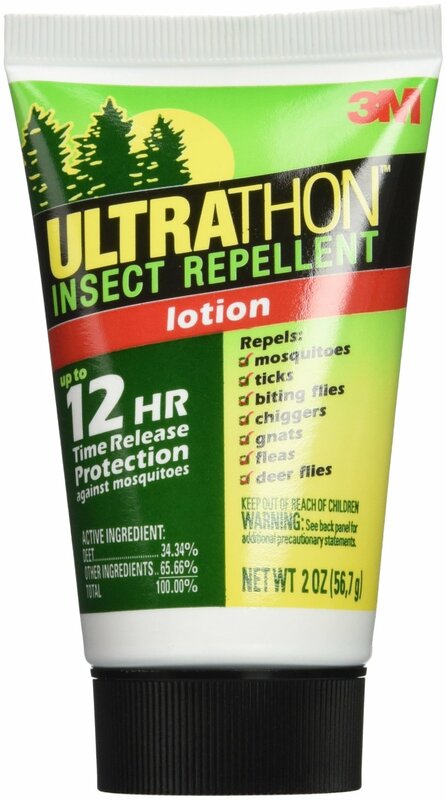 And one more lotion based insect repellent that is made with DEET and that was developed by the US Military to provide their troops protection against mosquitoes and ticks and all the diseases they carry like Lyme Disease, West Nile Virus and so on is this 3M Ultrathon. Like I already mentioned, this product is made with DEET, however, since the manufacturers of this lotion use innovative 3M Polymer Technology, they also have optimized the efficiency of DEET, so that it can provide soldiers with a time controlled DEET release, meaning that once the lotion is applied even water, sweat and other possible outdoors conditions won’t lessen the lotions ability to repel insects, since DEET is released gradually over a 12-hour time period, which also is the rated time, for how long the lotion can repel mosquitoes without being reapplied. So if you want the answer to the question – what is the best mosquito repellent – you might find that this lotion will get the job done, because it has been rated as best insect repellent for years now. On top of that the manufacturer also provides 5 year guarantee and the product even can easily handle the most extreme conditions from freezing to thaw to scorching heat, and it will be as efficient as you first purchased it. Developed for US military, this lotion will withstand even the harshest of conditions while providing the best and most uniform protection against insects. The lotion form might not be favored by everyone. If you are looking for an all-natural solution that still provides a fairly long protection against mosquitoes yet not irritating your skin or doing harm to the environment, then you should check out this Eco Defense spray. 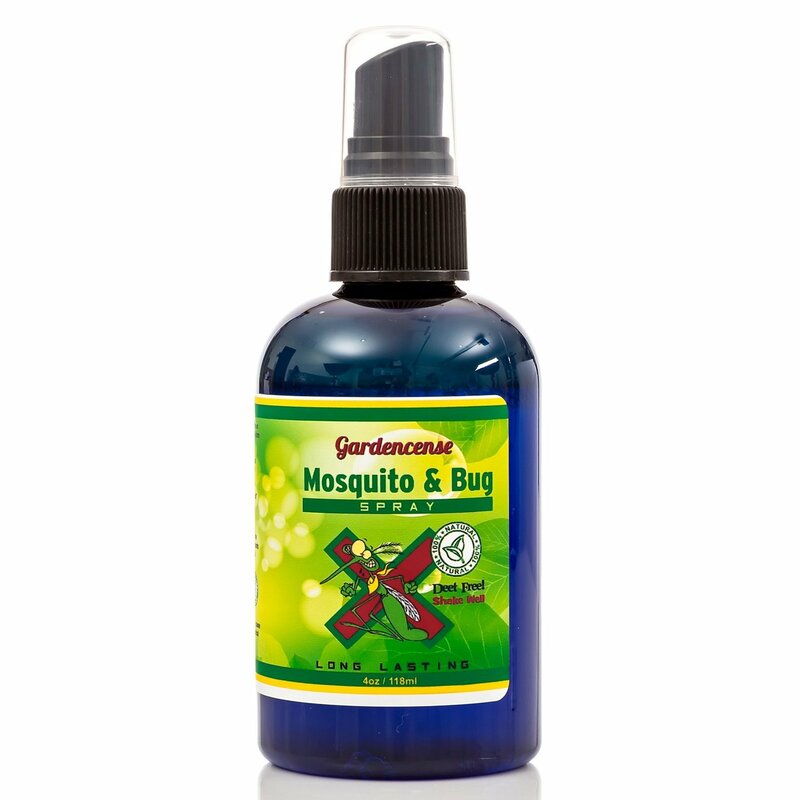 The active ingredient in this particular product is Geraniol, an alcohol and monoterpenoid combination, which is proven to be quite efficient plant based mosquito repellent. So this bug spray will be able to keep these bugs as well as insects like chiggers, ticks, fire ants, gnats and so on away from you and your family. 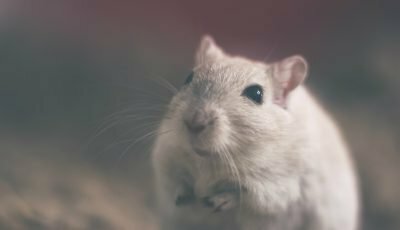 On top of that, because the active ingredient isn’t a chemical, it is totally safe to use this product on children and even pests, to keep them save from pests, too. 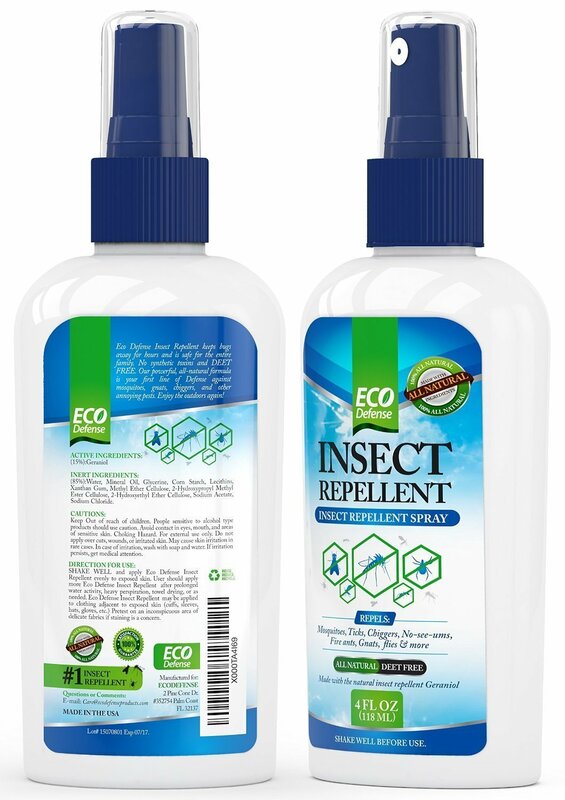 Eco Defense comes in 4-ounce bottle with a spray applicator, that will allow you to easily spray it all over your body, anywhere there is exposed skin and even on your clothing, so all of you is protected from mosquitoes. Thanks to the natural ingredients the spray will have a light citrus and menthol scent, that will make the application more favorable and the formulation of this bug spray will last for a couple of hours and only then you will have to reapply it to prolong its efficiency. Effect of the spray lasts for several hours. The small bottle might not last a long time if it’s used frequently and on large group of people. 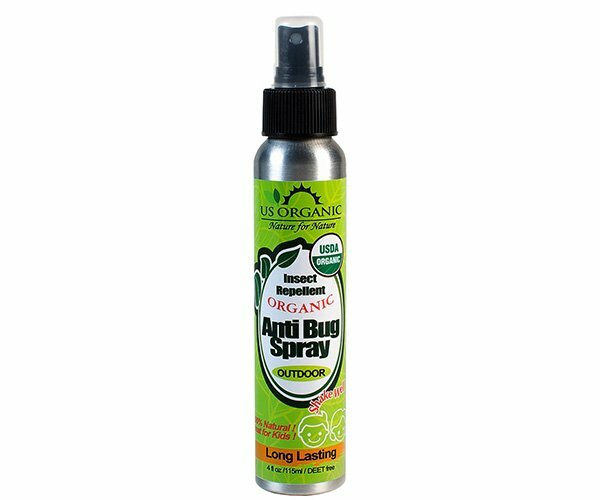 An anti-bug spray that you must check out is this one by US Organic, because it not only stands out in terms of packaging, but it also is long lasting and made with natural ingredients. Speaking of ingredients, the active ones in this spray are different essential oils that each is added to this spray in different amounts. This bug spray is made up from 40% soybean oil, 10% castor oil, 3.65% lemongrass oil, 3.40 % Citronella oil, 1.30 % cedar oil, 1.25% Rosemary oil, 1% Peppermint oil. 0.2% Geranium oil and 39% deionized water an 0.2% lavender oil, from which the last two ingredients are the inactive ones, that add scent and the consistency to the spray more than the mosquito repelling qualities. From this array of active ingredients, we can conclude that not only this spray will be efficient at repelling mosquitoes and other biting pests, because all of those active ingredients are known to be good mosquito repellents, but the spray will also smell very pleasantly and you won’t be able to smell any of the unpleasant chemical aroma, that often can be attributed to products containing DEET. 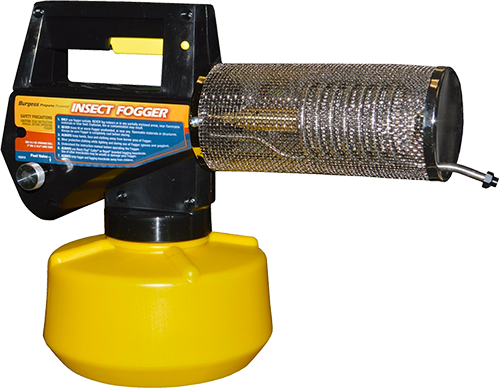 The efficiency of this product is several hours, so once you apply the bug spray, you will be able to go without reapplying it for quite some time. The 4-ounce bottle with fine mist spray nozzle will allow you to precisely apply the repellent to areas where you need it, and once you have done it there won’t be any residue or lingering scent, only mosquito-free air around you. There are no DEET, parabens, preservatives, petroleum based ingredients, gluten, artificial colors or added scents used to make this product. It comes in smaller bottle, that might not be enough for use in extended period of time. Another contestant for the best mosquito repellent title is this Gardencense mosquito spray, because it is an organic insect deterrent which is not only efficient, but also kid safe and will keep away most biting insects. This spray consist of only 5 ingredients – 89% water which is the inactive ingredient and 5% soy bean oil, 4% citronella oil, 1% lemongrass oil and 1% cedar oil which all have proven to have mosquito repelling capabilities, so it is not only natural, but also quite organic and mild. However, that doesn’t mean that it won’t provide great and long lasting protection against not only mosquitoes, but also ticks, flies, chiggers, gnats and other insect annoyances, that tend to ruin our outdoors time. The essential oil combination also provides that this product has pleasant aroma and that it is free of things like toxins, DEET, parabens and sulfates, that often can be found in repellents made with chemical insect repelling substances. And the natural protection agains insects will last you a couple of hours. Use it on your skin, clothing, or even your kids and pets, and make sure all those closest to you are protected against mosquitoes. The combination of essential oils might cause allergy for those who are allergic to certain oils or plants. 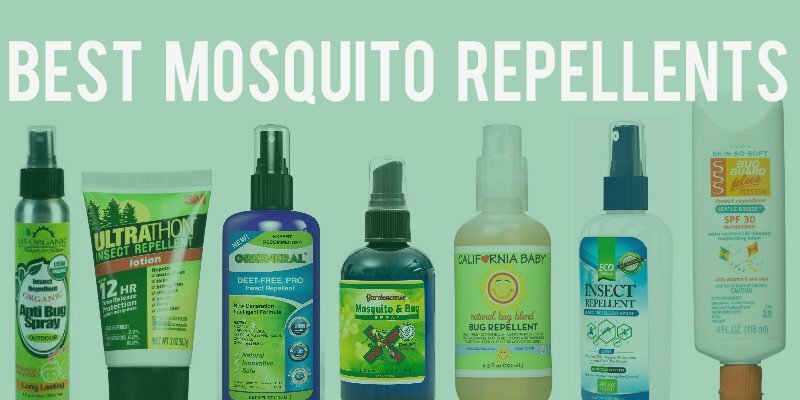 A mosquito repellent that every parent should know about is this California Baby bug spray, because it is natural, it is healthy, but most importantly it is efficient against multiple different insects from mosquitoes to ticks to even fleas. 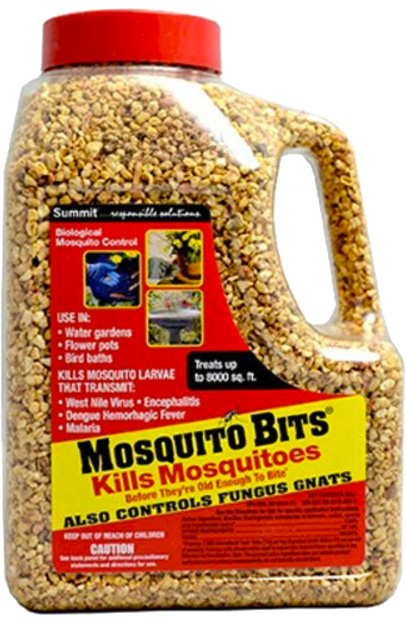 Ingredients that are used to make this particular product that mainly is intended for children, are a simple blend of lemongrass, cedar and citronella oils, however don’t let the ingredient count or the fact that there is no DEET among those ingredients fool you, because it still is highly efficient at keeping mosquito, flea and tick bites at bay. On top of that this spray also will last for a couple of your, so you won’t need to reapply it every 10 minutes. The bug repellent spray comes in 6.5-ounce bottle, which is a bit bigger than traditional mosquito sprays and will make sure that you can use for longer time. The spray itself won’t irritate your kids skin, in fact it will moisturize it and make it appear healthier. And it has nice citrusy, fresh scent that your kids will lake, making it easier to get them to let you apply it. The pleasant fresh scent of the product and pump spray applicator will make it easy and enjoyable to use. Because it is more of a bug spray for kids, it might not be efficient enough for adults. 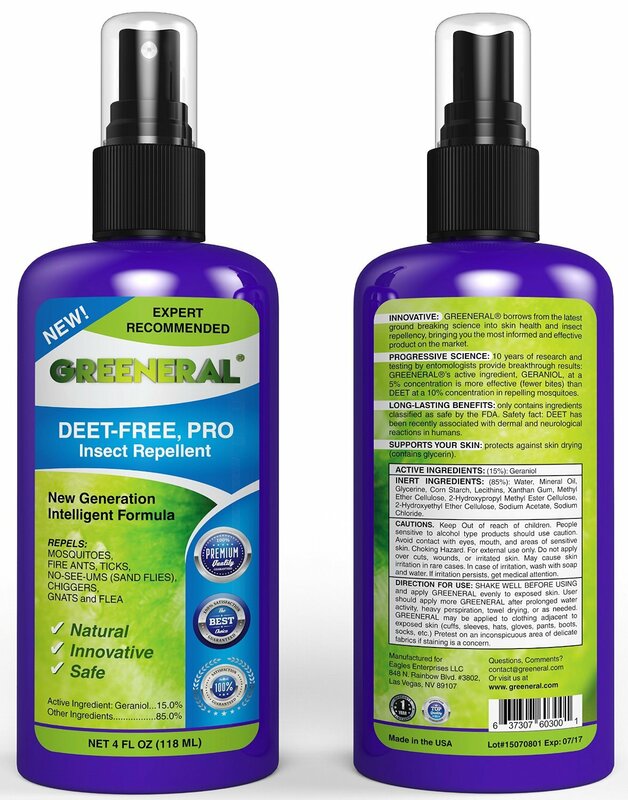 Then there is this Greeneral PRO spray that is natural, DEET-free, efficient and made for protection you from different pests repelling mosquitoes, ants, ticks, sand flies, gnats, chiggers and fleas. This new generation insect repellent is meant especially for people with sensitive skin, because the active ingredient here is Geraniol, which is a natural substance. Apply this to your exposed skin, and in seconds you will be protected against mosquitoes without any skin irritation, sticky residue on your skin or any other problems. On top of that this product is long-lasting, providing several hour protection, it has a nice, fresh scent, that will leave you refreshed rather than not wanting to ever use the repellent ever again, and it is also completely organic. In addition when purchasing this product you get a free book – “20 fun facts about mosquitoes” with your purchase. The 4-ounce bottle with spray application will be easy to travel with and easy to apply. Because it is a geraniol based product, you will have to re-apply it every few hours to get the full benefits from this spray. And last on this list is this Cutter Skindations spray that is unique product merging the convenience of a sprayable mosquito repellent with the skin benefits of a lotion type bug spray. This is a great product, because it will repel different biting insects like mosquitoes, biting flies, no-see-ums, gnats and even fleas, since it consists of 7% DEET solution that is known to be the most efficient mosquito repelling substance. It will also protect you from different diseases that these insects and more specifically mosquitoes can carry like Zika and West Nile viruses. But since this bug spray is specially formulated so it has added Aloe and vitamin E in it, it will also not only make your skin mosquito-proof but also will make it softer. Moreover, the repelling solution also has fresh and clean scent, that won’t bother you even if you need to apply it many times a day and most importantly the effects of it will last several hours, so you won’t have to think about your mosquito protection every second of your day, letting you enjoy outdoors time with your friends and family. Repellent keeps not only mosquitoes away, but other biting pests like gnats and fleas too. Not everyone might want the added vitamin E and aloe in their repellent. A good mosquito repellent is one that can keep away mosquitoes and still correspond with all your beliefs and values, whether they are to use or not to use chemicals on your body or to go or not to go for only organic products. So to help you find a good product that is meant just for you, look into our list of 12 of the best insect repellents on the market.